QGreetings! After researching the topic on the ’Net, I decided to get a couple of mice yesterday. I’ve had experience with rats and guinea pigs, so I figured why not? Anyway, many articles have stated that male mice can and do often get along just fine in a cage, provided it’s big enough that they can both have special places for themselves. It helps when they’re from the same litter, too, and age factors into the equation as well. Because of those articles and my belief that rodents are, by nature, very sociable animals, I purchased two male mice from the same group that appeared to get along splendidly. They’re currently very happy together, snuggling up in their nest and playing. My question is why does your article on your web site specificially mention that male mice will fight if housed together? There was no exception in the article at all. I thought AFRMA wanted to give accurate information. Did I miss something? AMost of AFRMA authors ere on the side of caution. We have seen it over and over where males will start fighting as soon as 3–4 weeks of age, some not until 6–8 weeks. Also, many breeders and mouse owners have had injuries or even fatalities by leaving brothers or father/son(s) together. We have also seen, on occasion, that two siblings or a father/son get along quite well together for a time, then start fighting. It is even rarer to have them get along for their entire life. It would be quite unfortunate if we said that male mice got along using such and such criteria and then had an animal maimed or killed even though the owner followed our advice to the letter. All animals are unpredictable. Mice also take their behavioral cues primarily from scent. All it would take to drive a male mouse into a territorial frenzy is the smell of a wild mouse on your clothes after you have cleaned the garage, or the smell on a newly purchased toy or dish because an employee of the pet store handled mice and then stocked a shelf without washing up. 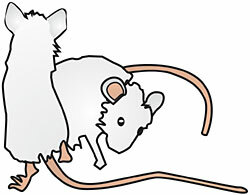 The risk of the potential for disaster far outweighs the possible benefits of housing two male mice together.